Why the Diet Will Never Work – Eat Me. Drink Me. Right now, I’m sitting on a train from Berlin to Stuttgart, thinking back on my visits, the conversations I had, the things I saw, and the millions of pounds I gained. Not that I would give one single pound back. In fact, I’m stocked up for this train trip with a hefty mound of honey-laden pastries from Al-Jazeera, a Turkish Konditorei that my mom just happened to find once on a bike trip through Berlin. When we first picked up our goodies, we walked into the two-armspan-wide store and asked for one of everything. The man on the other side of the counter couldn’t quite comprehend the request and asked us every third pastry or so if we really meant one of each. Oh yes, we did. And it didn’t take us long to walk back to our bikes locked other side of the street, open our three boxes of pastries and sample each piece. 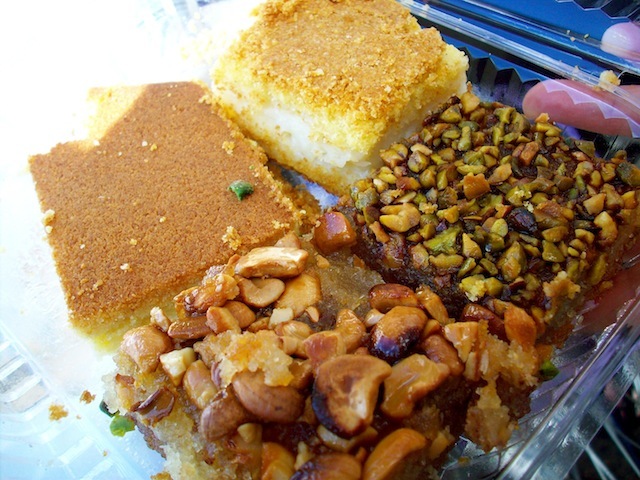 We had an assortment of Turkish baklava, stuffed with pistachios or peanuts, halva or melting sugar and layered between crisp sheets of phyllo dough dripping with honey. There were three types of cake, one filled with apples and custard, another with crumb pressed into rose-water flavored cream, and a third which the pastry cook brought out after we had paid and which looked so good, we asked for a piece of that too and paid again. After an extra-vigorous bike ride (a guilty calorie conscience? ), we stumbled into a packed Vietnamese restaurant/café for lunch. Hamy, as the restaurant is called, only serves two dishes a day. 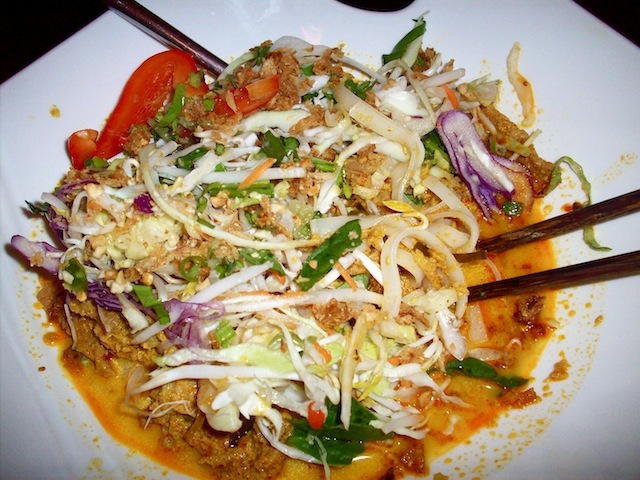 Judiciously, my mother ordered the chicken curry on rice and I ordered the Pho with pan-fried pork over rice noodles. Hands down the best Vietnamese food I have ever eaten in my life, and for five Euros, the most reasonably priced. Both dishes were piled with fresh vegetables, and my pho redolent of Thai basil, lemongrass, and chiles. Despite our Turkish pastry escapade, we both finished every bite on our plates. I’m finding it hard to figure out which culinary adventure I liked the most, but one of the most relaxing and delicious eating experiences I’ve had so far in Germany was at Schlesisch Blau, a tongue twister if nothing else. Schlesisch Blau is an amazing, homey, gourmet restaurant located near the Oberbaumbrücke, where you can walk along an extant section of the Berlin Wall, now covered in murals commemorating the East-West split. After walking along the wall in the chill evening air, we circled back down into Kreuzberg and the warm glow of Schlesisch Blau. We were seated at a round wooden table in the corner, where we had a good view of the rest of the small, ten-table restaurant. As my mothers says, eating at Schlesisch Blau is like eating in someone’s living room. The soup cooks on a double burner against the wall of the dining room and it’s a serve-yourself affair. After soup, a big bowl of salad with mixed greens and two randomly selected bottles of homemade vinegar are placed on each table. The restaurant makes over fifty varieties of vinegar, and if you don’t happen to like what you have, you’re welcome to wander over to another table to try someone else’s. The restaurant’s owner and chef wanders around the room talking to and drinking with his guests while the waiter and waitress eat their dinner leaning on the corner of the bar. The wine flows freely, and though we protested that we were on our bikes and really couldn’t drink another carafe of wine, our waiter, probably on his third glass himself, winked and told us of course we could—and should probably even finish two. Apparently, though, only those patrons who order expensive bottles of wine are allowed to drink out of the sparkling, long-stemmed wine glasses. My mother and I, with our house wine, were relegated to smaller tumblers. The glasses of shame. For fourteen Euros, you get soup, salad, entrée and dessert. There is one soup, one salad, two entrees to choose between, and one dessert. I ordered slow roasted beef and my mom a pork roast rolled with herbs. Both dishes are the kind that cook all day and require very little prep time. But both, with their long cooking time, are tender and rich and served with a crisp vegetable medley of cauliflower, carrots, and potatoes in flavorful sauce. 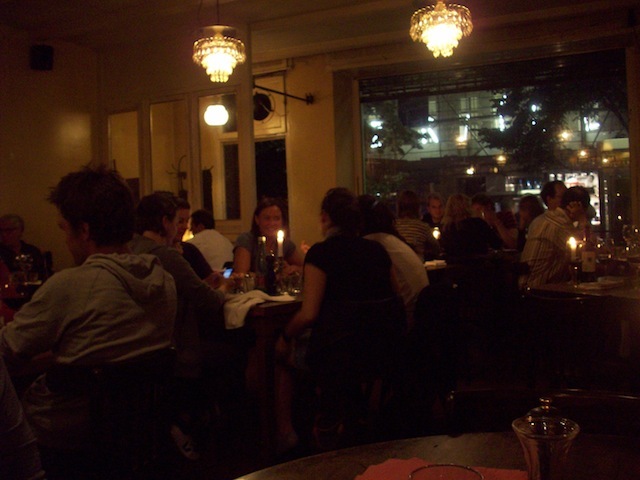 It’s the ambiance, however, that really makes eating at Schlesisch Blau a wonderful experience. It’s the comfort of the dim lights, the rustic furniture, the jovial waiters, the unassuming, yet lovingly prepared food. For dessert, there was berry pie, and though we were both so full of food, we finished all of our pie, the rest of the wine, and set off a little wobbly on our bikes into the Berlin night, sniffing out the next best thing to eat. I haven’t had the experience myself, but I find the idea of a restaurant serving only a few dishes intriguing and appealing. Sort of a “why would you NEED anything else?” mentality. I’m not one to say that people should like everything, but maybe our American menus — which often have literally hundreds or even thousands of possible combinations — encourage picky, narrow-minded eating. Godspeed on your transition to New York! Keep me informed so that I can seethe with jealousy and remain thoroughly motivated to get there myself.